We have pasta at least once a week; which means I'm always on the look out for new weeknight friendly recipes to try. I found the recipe below online and just happened to have sweet potato gnocchi in the pantry. I know it's an odd thing to just happen to have...but it's true. This sauce is a keeper. Quick, easy and delicious. If you don't happen to have sweet potato gnocchi laying around I think the sauce would go equally well with just about any pasta. Try it for yourself and let me know. I'm sending this in to Ruth at Once Upon a Feast for this week's Presto Pasta Night round up. 1. olive oil to skillet and heat. Add garlic, sausage, and capers and cook for 3-4 minutes. Add the tomatoes, salt, pepper, and wine. Cook for 2 minutes. Take off heat and cover. 2. Bring a pot of well salted water to a boil. Add the gnocchi. They will sink to the bottom. After the gnocchi rise to the surface, let them cook a minute more. Scoop them out with a wire mesh skimmer or what-have-you and put on plates or bowls. 3. Add pasta water to the tomato mixture and stir. Pour over hot gnocchi and serve. Sweet potato gnocchi AND capers! This is like an explosion of flavor. That's the kind of thing we just happen to have around too! So funny. It must be an Italian thing. This rocks! What a great dish - it is definitely a keeper. Thanks for sharing with Presto Pasta Nights. I think I've been eating far too many vegetables, I need this! Thanks for stopping by my blog. You gave me the chance to visit yours. This dish looks and sounds like a big hit! I will be following your blog for more. That looks great and easy! I love the sauce! I moved to Phoenix years ago from the Midwest and understand completely how hard it is to find anything different. No markets, butchers or delis just the chain grocery stores. I went on vacation "home" this summer and brought back a cooler full of food. 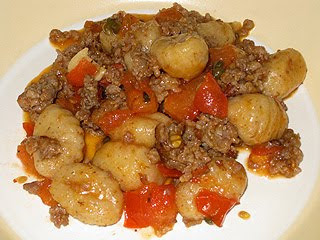 Unfortunately, I don't have any sweet potato gnocchi in the pantry but I'll have to pick some up and give this a try. Looks delicious! Wow, this is sure a weeknight pasta dinner that I'd love to have...and soon :-) Looks delicious! This looks delicious! I've never made gnoochi, but i think i'm going to have to give it a try.